Not only are there specials on everything from organic virgin olive oil to tofu, but with summer sunshine just waiting on the horizon, you can learn some great ways to protect your skin and preserve good health by making sure that antioxidants are included in your diet. The article also calls attention to the benefits of vitamin E and alpha lipoic acid, which appears to reduce fine wrinkles. Stock up on Amy’s Burritos in assorted flavors for $2.19 in May. There are also lots of picnic item specials that include meat -free hot dogs, pretzels, potato chips, rice burgers and hamburger buns. 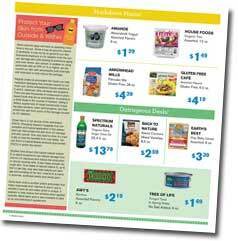 Click to download the multi-page May specials in PDF format.